Getting started is easy. The first step is to schedule an introductory private lesson with one of our professionally trained instructors. The private lesson costs $59 and includes one group class where you will have a black belt helping you every step of the way. If you decide to join the dojo, $59 will be deducted from your registration fee. Can I really do aikido? Yes. If you can walk up and down a flight of stairs, you can do aikido. We teach the beginner three basic techniques from which the entire art of aikido is derived. 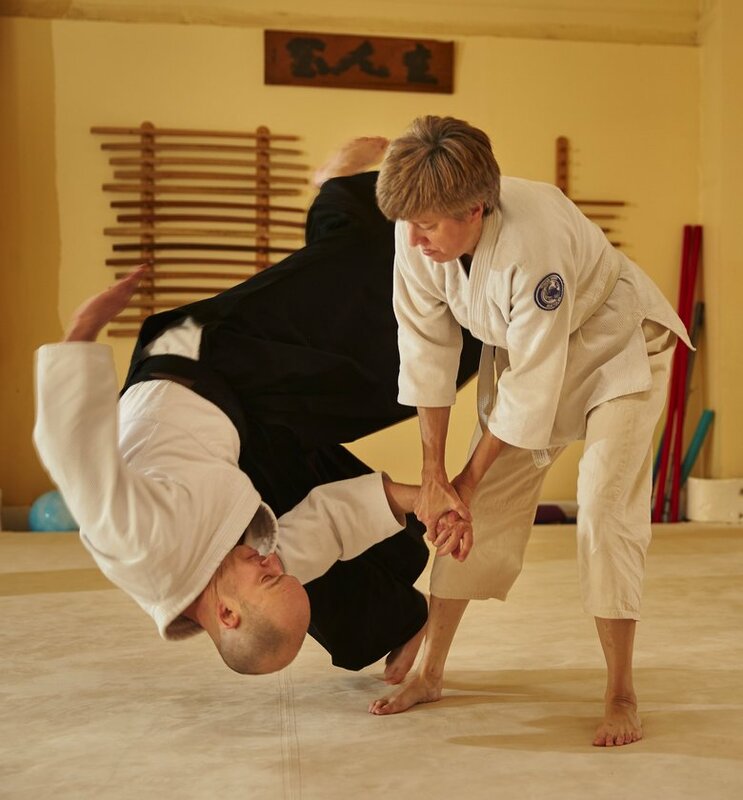 The Tenzan Aikido approach helps you to build a foundation that will give you clear direction in meeting your practice goals. What if I am out of shape and uncoordinated? Compassion is at the heart of aikido practice. At Tenzan Aikido, we know what its like to be a beginner. We’ve all been there. Everyone makes progress at a different pace. The Tenzan Aikido approach allows you to learn at your own pace and to take the next step only when you’re ready. How long will it take to learn aikido? The time it takes to learn aikido depends on how proficient you would like to become. After your very first class you will know how to blend with an attack, do a basic meditation technique and you will have taken a significant step towards physical fitness and clarity of mind. To become a black belt takes on average 4 years. Most people see steady improvement practicing 2 or 3 times per week. The more you practice, the greater the benefits to your health, ability to focus and self-defense. If you can practice every day, you’ll make faster progress. Practice as often as you can. How good are the instructors at Tenzan Aikido? Kaicho, Bruce Bookman apprenticed in Japan and studied with direct students of the Aikido founder, Morihei Ueshiba. He began aikido in 1970 and became the youngest aikido black belt in America at the age of 15. Kaicho Bookman was last promoted to 6th Degree black before starting his own Aikido organization in 2000 . Kaicho Bookman is regarded as one of the top aikido instructors in the country. The teaching staff at Tenzan Aikido go through rigorous training and are taught specifically how to teach by Kaicho Bookman. While Kaicho Bookman teaches most of the classes, our promise to you is that you will get consistent, professional instruction, regardless of which member of the staff is teaching. Is aikido about learning to fight? No. While you will gain practical self-defense skills, the main goal of aikido is to bring compassion, sincerity and self-scrutiny into all your daily interactions. Aikido training promotes health, self-reflection and personal empowerment. In aikido you become the person that nobody wants to attack. 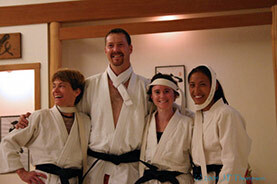 How much does it cost to be an adult member of Tenzan Aikido? There is a $65 registration fee. Dues are $140/month for unlimited practice. A uniform costs $75. Our best deals reward commitment. Buy the 6-month package for $740 and get a free uniform. Check out our family discounts that make it even easier to fit aikido into your budget. What should I wear while practicing? Until you get your uniform, you may practice in long sleeve cloths that you feel comfortable exercising in, that cover your elbows and knees. If I become a member of Tenzan Aikido, will I be practicing with children? No. The adult and children’s programs are completely separate. We do occasionally have events where parents get on the mat and practice with their children. Can I shower after class? Tenzan Aikido has two showers in each dressing room. Additionally, the changing areas are equipped with sinks mirrors and counters for getting ready. Towels available at no additional cost.